When kids get sick we provide treatments that focus on a safe and quick resolution to illness using herbal medicine and pediatric acupuncture therapy. Children are treated using either pediatric acupuncture or non-needle therapies that are safe, effective and painless. Acupuncture treatment for babies and children is one aspect of acupuncture pediatrics and is something we use regularly here in our clinic. As defined by the Holistic Pediatrics Association, holistic pediatrics is a practical approach to pediatric care that focuses on the principles of health, wellness and the safe resolution to illness. Holistic pediatrics is dedicated to integrating treatments that utilize natural methods to stimulate healing, recover balance and support the body’s own resilience. As an adjunct to conventional pediatric care, I offer “baby/child well visits” where I spend 30 – 60 minutes with each pediatric patient and their family. This extra time allows me to address some of the deficiencies of conventional pediatric care such as nutritional counseling, illness prevention, attention to environmental toxins, and home treatments that can be initiated at the first sign of illness. I am very passionate about using holistic treatments for babies, children and teens. I believe that each child is unique and that generic western treatments may not always be able to adequately address the challenges faced by each child. Before resorting to powerful western drugs, which may have unwanted side effects, I recommend trying therapies which are less invasive and have no unwanted side effects. Babies, children and teens respond rather quickly to both needle and non-needle treatments. They may experience a significant relief in symptoms immediately or shortly after their treatment. When they start to make the connection that treatments are helping, they gladly come back for more. Many of my pediatric patients ask their parents to bring them in for treatment. Once the bond of trust is built, they allow stronger treatments, more needles and in some cases they become even braver than adults! I see children for many of the same conditions as adults and most commonly treat allergies, behavioral issues, learning issues, sleeping problems, headaches, constipation, diarrhea, coughs and colds. I also treat a lot of chronic conditions such as asthma, eczema, bronchitis and sinusitis. Babies are often treated for sleeping problems, colic, reflux, constipation, pain and failure to thrive. 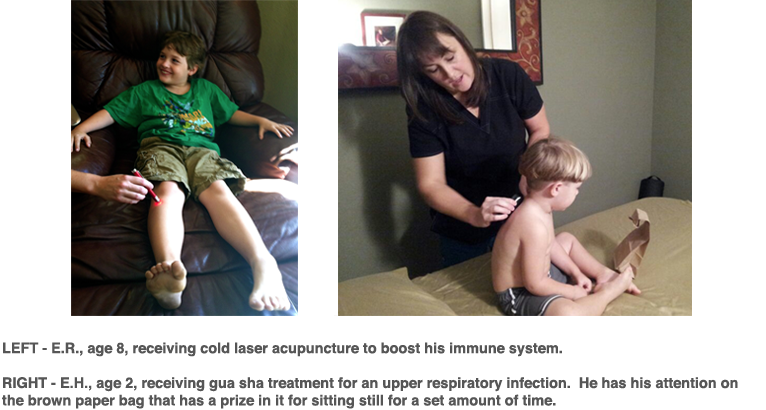 Pediatric acupuncture treatments are becoming more widely used and are very well tolerated by children. Acupuncture is effective for treating a wide variety of common childhood ailments. It works with the child’s body to heal the underlying imbalances to prevent future illnesses. There are many studies coming out of China and Germany proving the effectiveness of acupuncture treatments for children. I believe it is only a matter of time before pediatric acupuncture becomes a mainstream treatment for our children here in the United States. Is Pediatric Acupuncture Safe for Babies and Children? Acupuncture has been safely used to treat a wide variety health problems in babies, toddlers and children for thousands of years. It is a safe, natural and effective treatment that works with the body and has very few adverse effects. As a pediatric acupuncturist I can assure you acupuncture is completely safe for kids and now there is current research to support this claim! The first systematic review study of pediatric acupuncture safety was published in the December 2011 issue of the Journal of Pediatrics. It confirms that acupuncture is safe for kids when performed by a qualified practitioner. Hair-fine pediatric acupuncture needles are used. Only single-use, sterile, disposable needles are used, thus infections from needles are extremely rare! The needles are hair-fine, virtually painless, and are inserted superficially into the skin so there is zero risk of puncturing a lung or other vital organ. Acupuncture needles are not always used for treatment. There are several different non-needle painless ways to stimulate the acupuncture points that have similar therapeutic effects as acupuncture. Non-needle methods do not penetrate the skin so there is zero chance of any adverse reaction. In my experience the most common adverse reaction is a mild and brief discomfort (about 1 second) during insertion of the needle. Rarely, mild adverse reactions such as temporary bruising or swelling at the needle site occur but these are uncommon due to the special techniques used in pediatrics. In the fourteen years I’ve been involved in acupuncture never has a single pediatric or adult patient caught an infection from needle insertion, nor have I seen any serious adverse reactions. They do happen, but are extremely rare and very unlikely if the practitioner you choose is qualified and has special training in pediatrics. In babies and toddlers non-needle methods are generally used to stimulate acupuncture points. Thus, fear and crying are extremely rare. In kids under age 8, acupuncture needles are not retained in the body. The needles are swiftly tapped in and immediately taken out. Children only need to sit still for a few seconds at a time during the treatment. In kids over age 8, they can generally sit still for 10 – 20 minutes with the needles in, but unlike adults the needles are smaller and inserted superficially minimizing any serious risk to the child. Treatments for toddlers and young children typically take place while they’re are playing. Most of the time, the needle insertion goes unnoticed by the child as they’re being entertained by their parent. I do routine examinations on children with their cooperation. I make it fun and we play games. In the typical toddler visit, after a thorough discussion of the child’s health the treatment will take about 5 minutes or so to complete, since the needles are inserted and immediately removed. The insertion and removal takes about 1 second or so. As kids get older and have memories of the hurt and pain from vaccinations, acupuncture is a harder sell for some. That’s when I start with non-needle techniques. I also like to refer to the actual acupuncture treatment as “Taps” treatment, because we quickly tap the needle in and then remove it. Children aren’t scared of the word tap, like they are of the word needle. Once kids are little more mature, around ages 8 – 12, the needles are retained while the child rests quietly for about 5 – 20 minutes. Pediatric treatments are customized to each child’s temperament and specific needs. All aspects of a child’s health are taken into consideration: physical, nutritional, environmental, mental & emotional well-being. After a thorough examination and discussion of the child’s health history and current complaint, one or more of the following treatment methods may be used: herbal medicine, homeopathic medicine, nutritional supplements, pediatric acupuncture, cold laser acupuncture, tuina massage, electro-acupuncture, gua sha, cupping, home hydrotherapy treatments and/or dietary modifications. Time is always spent educating parents about tools and techniques they can implement in the home at the first sign of imbalance or illness. The quicker treatment is initiated, the less severe the illness and the quicker it is resolved. Will Children really try acupuncture and why? Many adults find it shocking that children can be treated with acupuncture. They can’t believe that babies and children will let me insert needles in their bodies, let alone enjoy their treatments. I think this view is common because they think I’m treating children the same as adults. Maybe they imagine their 3 year old laying on the table for a half hour with acupuncture needles. Not on your life! 30 – 60 minutes are usually spent with pediatric patients, but most of that time is spent discussing their health concerns and offering solutions and treatment method options. The acupuncture portion of the treatment is painless and lasts between 2 – 10 minutes. Pediatric treatments, especially for kids ages 6 and under are very different than treatment for adults. From the moment children walk through my clinic, they are very aware that this will not be a typical doctor visit. The environment is relaxing and calm, soft music plays, lights are dim. When I meet my pediatric patients, I talk to them directly and make sure they understand that I’m here to help them and I respect them and their bodies. Trust begins as I proceed with their physical exam. Looking in ears, pressing on their belly and listening to lungs becomes a fun game. They are not forced to do acupuncture if they don’t want to. When children refuse acupuncture, I use other non-needle treatments that are very effective until the child is ready to try the needle. Eventually almost every child that walks through my clinic door will try acupuncture. To their amazement, they find it is painless! We can work together to strengthen your child’s immune system so you can get off the infection/antibiotic wheel. We offer an alternative approach to pediatrics and find that children respond beautifully to these ancient healing methods. Take the first step to improving your child’s health and call or schedule online today.